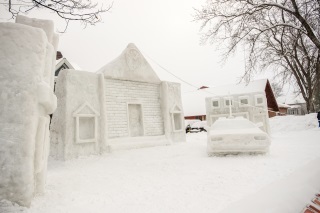 One of the most exciting events at the Winter Carnival is the Snow Statue competition. For years students at Michigan Tech have created massive snow sculptures all around campus and their creations are magical! The sculptures take about a month to build and require a lot of engineering skills. Students use a variety of tools to create intricate details and the snow statue comes to life. Ben Ellis, a student who competed in the competition said, “It takes a lot of work to put these things up, but once they’re done they look amazing.” This event also draws large crowds of visitors from across the country to see what the students have created. Come and see them for yourself! For international students that are looking for a US school full of tradition, community and changing seasons, Michigan Tech is the place for you! Their ELI program is there to help you improve your English language skills through learning both inside and outside of the classroom, like at the Winter Carnival. Michigan Tech is a wonderful school that welcomes all students into its community! By having traditions like the Winter Carnival you’ll be a part of the school’s rich history. You’ll also make memories with your new friends and experience the snow like never before! The post Winter Carnival at English Language Institute at Michigan Tech appeared first on The International Student Blog. Deloitte East Africa Annual Graduate Recruitment 2019 for young Graduates.